There’s a whole new front page for staff in Apollo! 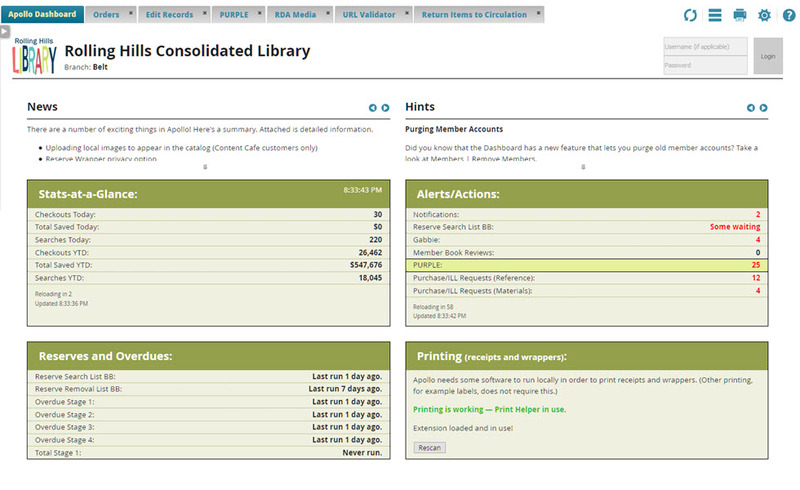 The Dashboard brings a sleek new look to staff’s primary access/home page. It provides unprecedented access to key information with up-to-the-minute status. Tabs are managed internally to the Dashboard allowing for features like auto-restore and precise labeling. Staff authentication: use of usernames and passwords. This will allow for future logging of all actions. Tile approach to provide a wealth of auto-updating information easily open multiple tabs in the same module, with prompting about opening a duplicate tab. The News might be for all customers, customers in one state, or just your library, etc! The Dashboard is available immediately at no charge for all customers to test drive; on their schedule. There is no current timetable to force customers to switch. They can move back and forth from the Dashboard to the Classic interface at will, and on a PC-by-PC basis. When ready, one click will take them out of the trial mode to use the Dashboard permanently.